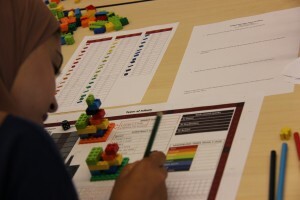 Games can be useful tools for teaching aspects of construction management that are not easily transferred through traditional lecture-based approaches. Stories of the successful application of certain construction management tools or methods are, due to their retrospective value, of limited value for building up an understanding about how to solve a practical problem one faces. Similarly, simple educational assignments do not reflect construction practice well since they often neglect aspects like uncertainty, urgency, ambiguity and complexity. Games, however, balance elements of conflict, a motivation to win and a scoring metric to create an imaginary experience that players can relate to and understand. They can therefore be a useful tool for construction education. As part of my research, I have been developing a one-person game called ‘Tower of Infinity’. 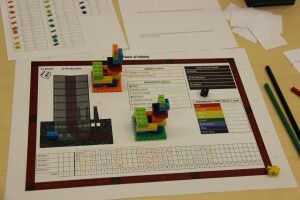 This game revolves around the design and construction of a multifunctional skyscraper in the heart of a city center. The player plays a company that has been awarded this prestigious contract and now needs to come up with a design, purchase building materials and assemble the tower in line with the design. 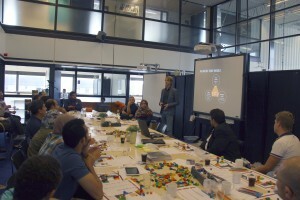 The game simulates reality through the use of LEGO bricks for these activities. It challenges the player to deliver the building to the lowest cost, as soon as possible and according to the highest quality standards – within certain constraints such as the size of the construction site. The game thereby aims to convey how design and construction tasks interact with each other and what it takes to coordinate those. 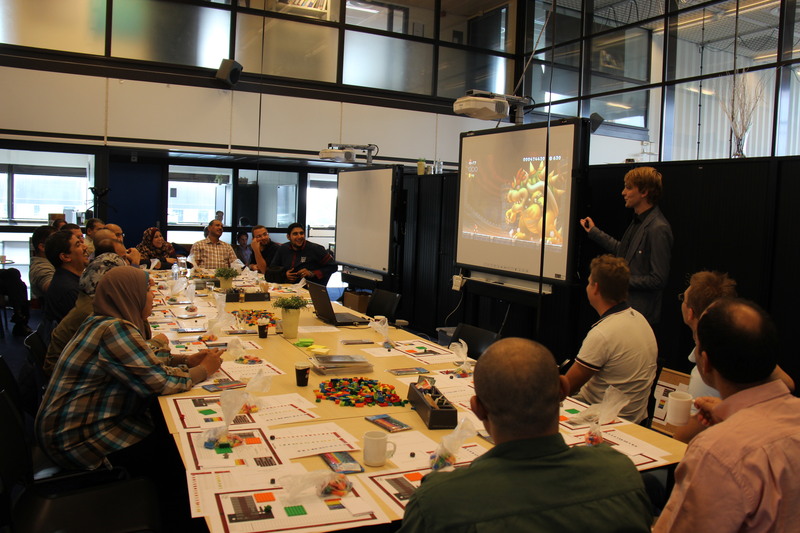 The game has been put to the test in a recent workshop with about 25 experts from the construction education domain, the vast majority being Egyptian. 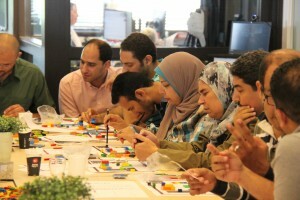 After I explained the rules of the game, the participants proceeded designing and constructing their own LEGO models. A central feature of the game is that all players start with the same set of Design LEGO bricks and share a common pile of Construction bricks. 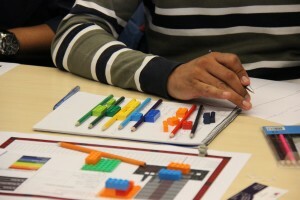 While playing the game, the participants found out that the number of bricks in both sets is limited and that different rules are applicable for using either Design or Construction bricks. Due to this game feature, the players needed to be creative as well as strategic in both the design and the construction stage of their project. This turned out to be fun. The feedback on the game was then also quite positive, although there is certainly room for improvement. After playing for about 45 minutes, I organized a discussion on the game around three ‘worlds’ that need to be in balance: play (goals and rules of the game), reality (connection to practice) and meaning (value for education). 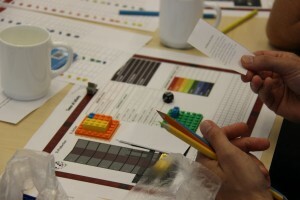 Some feedback I got was that it was “lots of fun playing with LEGO & colors”, the game is “good for teaching some concepts of construction such as: supply chain, resource allocation, time-cost trade-off” and that “it is a new and very fantastic way to make construction science more easy to imagine”. On the other hand, many people argued that it is a “little bit hard to understand” and that “more instructions are needed to make it clear”. Others also noted that the game loses some connections with reality due to certain simplifications (for example: the chance for a risk (called “event” here) to occur is 1/6 for each round of the game). This kind of feedback is very valuable to further develop the game. Following the suggestions of the participants in the workshop, I plan to simplify the rules of the game, revise the game mechanics related to the project’s risks and make the client’s list of requirements more explicit and better measurable. Additionally, I plan to digitalize the game so that it can be played online rather than as a board game. In the near future, I will then also test, compare and report on the value of both types of games for construction management education.